Chris visited ToonSeum during our time in Pittsburgh. Read about his visit below. 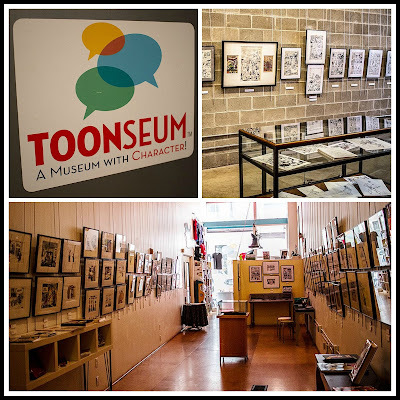 While the ladies were off shopping in downtown Pittsburgh, I took the opportunity to do a little sightseeing and made a stop at the ToonSeum in the Cultural District. It’s only one of three museums in the United States dedicated exclusively to the comic and cartoon arts. Since I’m a HUGE fan of both comic books and cartoons, I made it a priority to set aside some time to visit the ToonSeum – and I was not disappointed. The first main exhibit was Slinging Satire: Political Cartoons and the First Amendment. It was split into two parts: political cartoons addressing current global issues, and drawings that supported French satirical magazine Charlie Hebdo. The exhibit was thought-provoking and inspiring, though perhaps not for children. Slinging Satire is on display through September 20. But what really captured my attention was the other main exhibit: Avengers Assemble! Celebrating Marvel’s Mightiest Heroes. 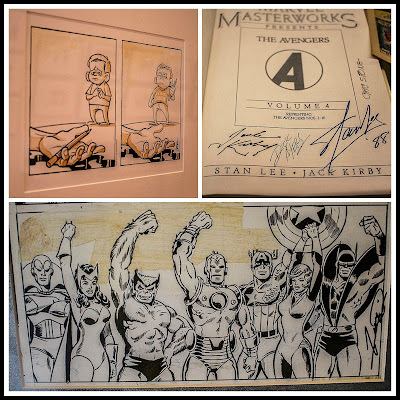 More than 50 years of Avenger original artwork is on display, featuring some of the best comic book artists to ever live, including Jack Kirby, Jim Starlin, John Byrne and Jim Lee. Plus, a lot of the material is autographed by the artists, as well as the legendary Stan Lee, who created (or co-created) just about every major Marvel character that’s currently dominating the movie box office. I walked around in awe, staring at the gallery walls like a little kid. Avengers Assemble! is only on display until August 23, so be sure to fly, web-swing, or run really, really fast to see it, true believers! Scattered on the walls, desks and displays throughout the ToonSeum were some extra special treats, such as incomplete Looney Tunes sketches and animation cells from 1980s TV shows. The staff worker was very friendly, informative and helpful – on the way out, she even let me “jumpstart” my iPod, which has this annoying habit of not turning on despite being fully charged. One quick plug in to her office computer and I was happily listening to Pennsylvania-area artists for the rest of the afternoon. Many thanks! I highly recommend visiting the ToonSeum when in Pittsburgh, especially if you’re a comic book/cartoon nerd like myself. Price of Admission for Adults/Children 13 and over is $8 Children over 6 are $4. Disclosure: Chris received free entrance for the purpose of this review from Visit Pittsburgh. As always, opinions on this blog are his own. As the curator of the Avengers exhibit, thank you for the kind words. I'm glad you enjoyed the artwork I was able to gather together for this show. It was a real labor of love. I hope you'll come back and see some of th exhibits we have planned for the next year such as James Bond, Star Wars and Captain America.